Looking for JIRA alternatives? We have 8 great project management tools to choose from! If you work in software development or project management, there’s a good chance you have heard of JIRA by Atlassian. With over 50,000 customers, boasting companies like Spotify, Airbnb, Cisco, and eBay, JIRA is one of the most popular project management tools for software development teams. JIRA is a software development tool that helps software teams plan, track and release great software. You can even evaluate project timelines and progress by generating automatic reports. JIRA users can assign and distribute tasks, track each project with full visibility, and get real-time reports to improve their team’s performance and efficiency. You can enhance Jira, by integrating it with thousands of add-ons including Hipchat, Zephyr, Bitbucket, Confluence and many others. JIRA also has mobile apps so that your software developers can stay in sync, even when you’re on the go. However, it’s not the ONLY collaboration and project management tool out there. Some users find JIRA’s interface a bit confusing and clunky. On top of that, JIRA’s cost can climb high as your team starts growing in numbers. While others just want to use a different product to capitalize on unique workflows or functionality for their business needs. Whatever your reason for searching for a Jira alternative is, we’ve got you covered. Bitrix24 is a wildly popular JIRA alternative that acts as a “social intranet” for your company. It takes inspiration from the social networking style of communication and allows users to make social profiles, add their information and images, instant message one another, share content, like updates and activities, comment on posts, and collaborate and communicate with each other using the activity stream. Bitrix24 provides tools for task management, document sharing, project management, CRM, email automation, workflow management, lead capture, and time tracking integrated into a social interface for maximum efficiency. There are also mobile apps available to use Bitrix24 anytime, anywhere. 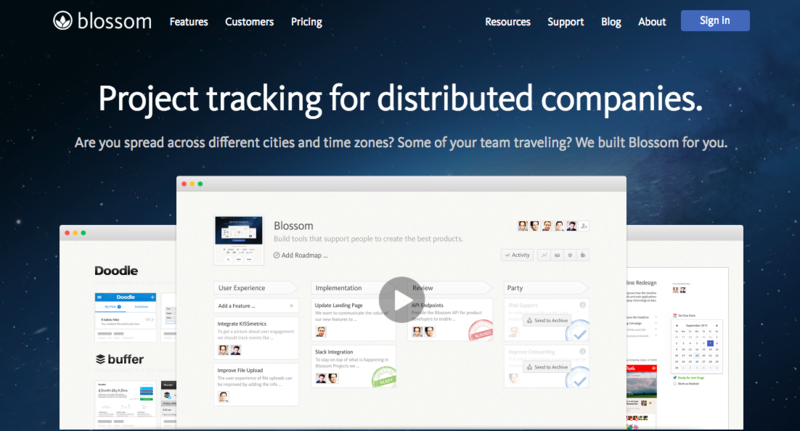 Made by keeping distributed teams in mind, Blossom is another JIRA alternative you should be checking out. One look at its dashboard and you’d know that Blossom is based on the principles of Kanban, a way of working that emphasizes iterative delivery cycles and continuously improves the workflow of your team or organization. Blossom gives a clear overview about who’s doing what & why in a team and at the same time it helps you to focus on what matters most. With Blossom, you can efficiently manage your whole development process in one place, built with simplicity in mind. Blossom keeps project management as lightweight & easy as possible. Does your team waste a heck lot of time doing estimates and sprint plannings? Blossom has integrated performance analytics reports which does all the planning for you. Apart from planning and reporting, Blossom has a ton of integrations including Slack, Hipchat, and Github. An awesome feature of Blossom is the “Daily email digest”. Blossom automatically sums the most important things of your progress in the last 24 hours and send it to your inbox. No email reports to send about your progress. Blossom has you covered! Asana has consistently been a crowd favorite tool for task management. Asana is a project and task management tool that makes team collaboration and communication a breeze. With Asana, you can assign tasks, view progress, have conversations all in one place. Asana is a fast, responsive, beautiful looking and feature-rich application. Asana users can share notes, attachments, follow and ‘like’ tasks, add due dates, and receive email notifications when a task is assigned to you or if someone on your team has made changes to the task or project. It makes it easy to add files to tasks, with size up to 100MB and the best part is there’s no storage limit. With plenty of third-party integrations like Dropbox, Hipchat, Zendesk and many more, Asana enhances your productivity and helps you handle all your operations from a single tool. Apart from the Kanban styled JIRA-esque interface, Asana allows your tasks and projects to be displayed in list view, calendar view, or file view. It’s a fun, simple app that gets the job done well. If your focus area is simply issue or bug tracking, you might wanna take a look at DoneDone. The issue tracker your clients will understand and your programming team will thank you for, DoneDone boasts of having the simplest user-interface and onboarding. DoneDone wants you to say goodbye to spreadsheets, sticky notes, and email to keep track of bugs, ideas, and requests and start using their platform instead. DoneDone wants to marry issue tracking with customer support and make work more efficient and smooth. It effortlessly tracks customer support requests in one simple workflow. Capture user feedback, customer questions, or any other issues submitted to your public facing email address. All support communications happen right inside DoneDone so everybody is in sync and informed. DoneDone issues make it clear who’s responsible for what. Its simple workflow, easy filtering, and release builds are a seamless fit with most companies. DoneDone allows you to view a list of issues, see individual activity from any day, or gather quick reports. Since it all happens in the cloud, all you need is a browser and an internet connection to get started! What sets ClickUp apart and makes it a compelling JIRA alternative is its machine learning capabilities. ClickUp automatically predicts who you’ll assign certain tasks to, where you’ll put those tasks, and can even determine if time estimates are accurate. ClickUp is aiming to do what other project management tools claim to do by reducing workload and automate redundant tasks to maximize productivity. Collaboration detection which allows you to see in real-time, who is viewing, commenting, and editing. Multitask toolbar to make changes to multiple tasks in one go. Check project progress percentage and track time spent on tasks with third-party integration through Harvest. With over 25,000 teams using it, ClickUp is a serious JIRA alternative to check out! Mavenlink is a powerful project management tool that helps automate project management, resource planning, project accounting, and team collaboration. This JIRA alternative is designed for service organizations and allows you to integrate your employees, task, projects, and resources for transparency and effective utilization. Mavenlink allows you to improve your project’s performance by monitoring budget, time and margins. You can also manage multiple projects with ease across different departments. Mavenlink’s advanced analytics provides business intelligence, identifies problem areas and suggests best practices. Managers and team members can gain control over margins, improve resource utilization, and better forecast revenue and cost. Mavenlink integrates with popular applications like Google, Microsoft, and Salesforce to help you have a single source of truth. You can’t talk have a discussion about JIRA alternatives without mentioning VersionOne, Jira’s #1 competitor. Designed from the ground up for agile and lean software development, VersionOne is all-in-one enterprise solution which is easy to scale up to any level and provides end-to-end visibility to all stakeholders. Apart from its numerous features, VersionOne also integrates with leading commercial and open source software development tools and applications such as Jira, CA Agile, ServiceNow, Microsft TFS, HP, Salesforce.com, Perforce, and GIT. Even though VersionOne is a worthy JIRA alternative, it may take some time for you to get up to speed and take full advantage of everything it has to offer. JIRA is one of the most popular and widely recognized project management and collaboration tools out there. However, it’s always nice to have some options available so that you can choose the tool that fits your team’s needs and wants. 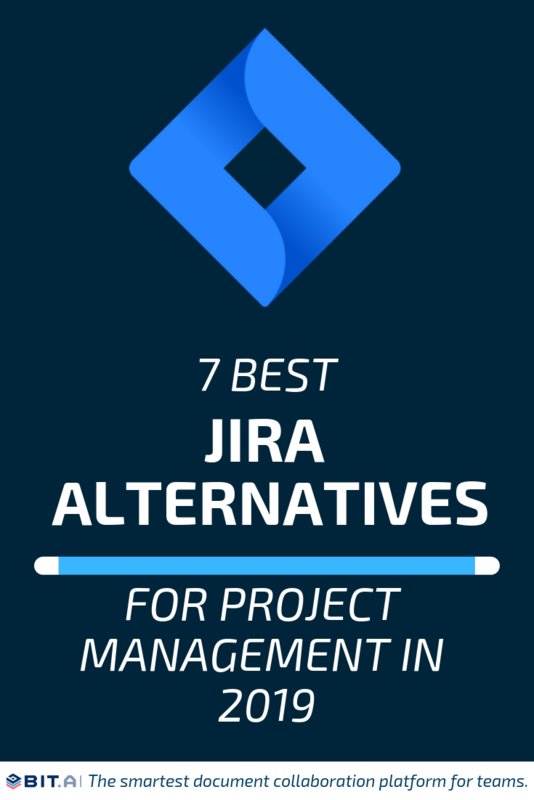 We don’t think you’d be disappointed with any of the above-mentioned JIRA alternatives. Nearly all of them perform the same way and it all boils down to a couple of key differentiators or pure personal preferences. Did we miss out on any JIRA alternative? Tweet us @bit_docs and let us know about your favorite tool!